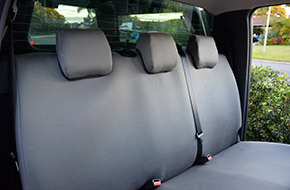 MMT Mining Services supply supafitting heavy duty canvas seat covers to fit a range of vehicles, trucks and ISRI Seats . Popular 4WD models we manufacture covers for include, the Ford Ranger, Toyota Hilux, Mazda, Holden and Mitsubishi range, all of which are airbag certified and tested and available in either canvas or denim. Our canvas seat covers are recognized throughout the industry as premium quality and are made using a heavy duty canvas that offers your seat maximum protection with no sacrifice for comfort. Due to this factor they are also used in mining and agricultural vehicles to provide protection to operator seats whilst machines are out on site. With all of our seat covers custom embroidery is available upon request; so why not customise your covers with a corporate logo for little extra cost. When it comes to seating we have got you COVERED!! For further information on our full canvas seat cover range and pricing don’t hesitate to contact us.